November 8: The civility of shutting my mouth pays big returns. This past Sunday at Church in Bethesda we started the month’s series of exploring the big themes of scripture that support civility, and this past weekend we talked about the theme of “I need to shut my mouth!” How many times does something strike us the wrong way, and a harsh or even inaccurate retort is flying before we really think things through? Are you able to see something on Facebook you don’t like and just scroll on? 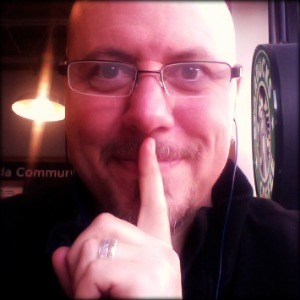 Can I keep my mouth shut when it really doesn’t need to be open? The first half of the verse is challenging for a pastor, or any blogger or pundit for that matter. What? Stop multiplying words? Words are our tools! Words are an amazing gift! Our species rocks the world of words! But, still the proverb warns us of thinking that more and more words are what we need. Sometimes we need silence. The prudent know this. pru·dent 1. acting with or showing care and thought for the future. ~ to think and reflect. I may even think of a clarifying question that gets us a lot further in our dialogue than a pointed reply. ~ to forgive. Too much is said too soon, too loudly and too wrongly, because I want to punish and retort more than I want to forgive and extend grace. ~ to choose what I will eventually say. If given a chance, on almost any day, how much of what we say would we say differently? If only we had a 10 second delay on our speech, hmmmm? ~ to stop a fight before it even gets started. That’s choice peacemaker stuff right there! ~ to stop a fight after it gets started by breaking the cycle. Because someone has to break that cycle of responses and one-uppers. Again, peacemaking instead of peacebreaking. Developing the art of shutting my mouth is not saying that words aren’t important or valuable, but in truth, it’s living like my words actually are important and valuable. It comes down to being aware of my words. Have I given myself time to make sure that my words are going to support the future instead of killing it before it has a chance to happen? If I go quiet on you, don’t worry… I’m probably just trying to buy myself the time I need to really value you and the words I’ll eventually say. This entry was posted in Civility, Devotional Thoughts and tagged Civility, Holding My Tongue, Prudence, Shutting My Mouth, silence. November 7: Civility is a debt I owe my neighbor. These few verses do a wonderful job of challenging an entrenched individualism and distorted sense of self-preservation that is an undercurrent to a lot of American dialogue… in my humble opinion. The scriptural witness often points us outward to a concern and care for others that at times will seem to defy common sense and definitely push us out of our comfort zones. The verses today are somewhat passive in their nature of “don’t do.” They are also somewhat aggressive in their nature of re-orienting me from one wisdom to another. What do I not do as a civil person of faith? I don’t plot ill for someone else, especially the “trusting” neighbor. We’ve already mentioned the place of empathy in civility, and now we add a new level of trustworthiness and “neighbor-care.” My neighbor should be able to trust that I’m not plotting against her or him. I hold a responsibility to commit myself to my neighbor’s good. In the same vein, I will not falsely accuse that neighbor. False accusation is not in their best interest, and therefore is it not an option for me. We sometimes speak of the public trust and what responsibilities the various levels of government owe us as citizens, but do we speak enough of the trust we hold to one another as neighbors? I must not plot and accuse the trusting, innocent neighbor. Civility means I am worthy of their trust. What about the neighbor who is not so innocent? I mean, if my neighbor steps out of line, well… we have a saying for that, right? We say, “Fight fire with fire!” I would bet the first time I ever heard that saying was in a cartoon, right around the time Bugs Bunny was declaring, “Of course you know, this means war!” But wherever I first heard it, there’s no question it’s an entrenched axiom (a perceived self-evident truth) that we have embraced. 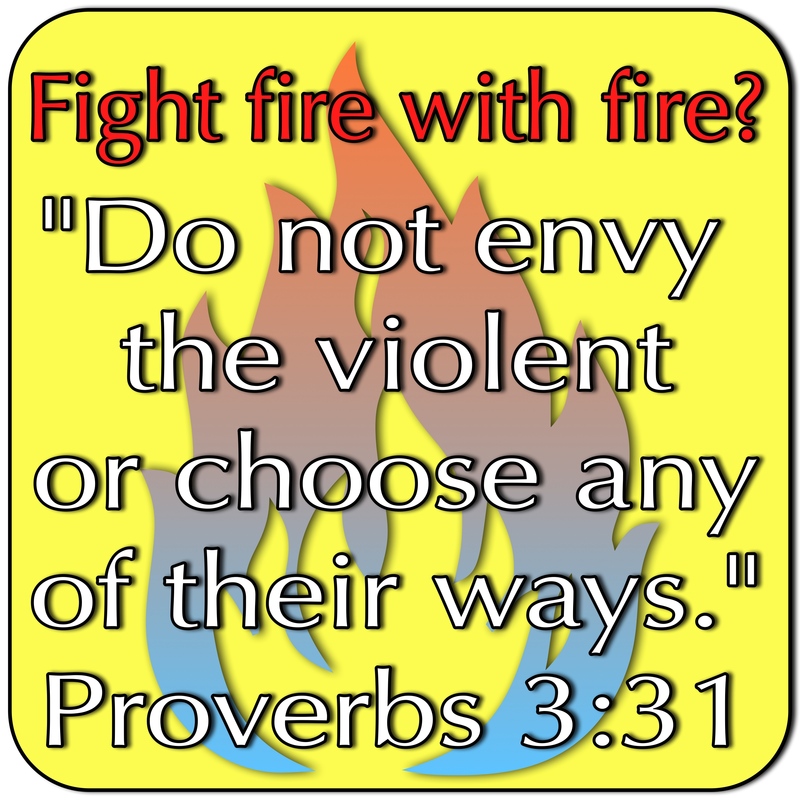 Our proverb challenges that with a simple injunction: Don’t envy the violent or adopt their ways. Wow. My faith is calling me to something greater than fighting fire with fire? I immediately think of St. Paul’s poetic words in Romans 12:21, “Do not be overcome by evil, but overcome evil with good.” That’s such an awesome chapter, right? Civility in my life will grow from a faithful development of trustworthiness in myself and a refusal to perpetuate the cycles created by a self-centered need to retaliate in kind against offenses to me. I look to my neighbor’s best interests. My neighbor, innocent or not, trusting or not, violent or not, has reason to expect a consistent lack of malice from me. No matter the gain that seems attainable by the ways of the violent, my path is already chosen and set. I pray that my neighbor is always safe with me. This entry was posted in Civility, Devotional Thoughts and tagged Accusation, Civility, Empathy, Neighbor Care, Trust, Trustworthiness. November 6: I am civil with the created because I revere the Creator. I once lived by a spring. I had grown up for some years running in the woods and playing in and around little spring-fed creeks, but then I moved and lived next to a bonafide right-there-in-front-of-me spring, a hole in the ground that simply gave and gave and gave. It fed several stock tanks and then a creek that meandered off somewhere past my fields of wandering. That spring held my imagination. It was both cool and scary… it was primal. James doesn’t think we can cultivate two streams of life, one of cursing and one of praising, one of sweetness and one of saltiness, but instead he expects us to choose. In the context of the passage he points to a problem with thinking we will praise God but curse God’s created people. He doesn’t believe we can be two people, reserving respect, dignity and praise for the Creator while living a life of cursing, reviling and destruction with the created. It’s my very love and respect for God that becomes the basis of my love and respect of God’s created people. I don’t have the option of loving God and hating people. I don’t have the option of being a “fig tree” with God and a “grapevine” with people. James insists that I be a whole person whose primal well-spring is consistent, sincere and good. And that is going to take some intention and some effort. James alludes to it being a matter of “maturity” and that’s a good word for it. This consistent wellspring of my life will be the product of growth and development. It has been chosen and pursued. It’s no accident. Neither a fig tree nor a grapevine will reach maturity on accident, but by the collusion of their nature, their cellular intent and the proper environmental conditions. As humans we have this amazing gift of conscience and consciousness. 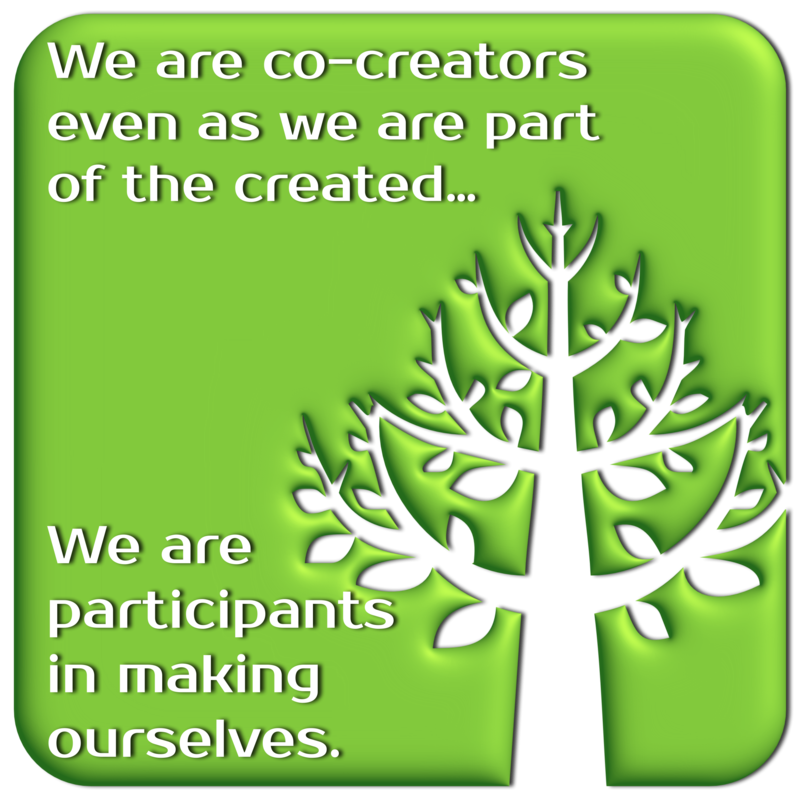 We are co-creators even as we are part of the created. So we are not just fig trees and grapevines; we are participants in making ourselves. Will we choose the best fruit, a consistent fruit and a “praiseful” fruit for our neighbors? I’m thinking back on that spring when I was young and the way it made me a little fearful. Clear, sweet water came from it, but I couldn’t see the bottom. There was no end to it’s giving. Maybe that’s my fear with civility. If I open that well in my life and give myself to it, where will it end? Who will come to drink of that well? Will I be emptied and drained completely? Can my well keep me refreshed while having to give so much to others? If I live a life toward the created that I live toward the Creator, will they abuse the gift? Will they understand? Will they be wasteful of it? Will they be deserving? Faith says I can give my well to God. Faith says that I can trust God with the bottom I can’t see. Jesus promised a Samaritan woman that he would provide a drink of water that would become an internal wellspring of life (John 4). He promised it to anyone who came to him for a drink. There is my seed-spring, my well-beginning. So the intent is the starting place, and then comes the long walk of effort. It feels cool and kinda scary. My faith says I can do this, but I still get a bit wibbly inside when I can’t see the bottom. This entry was posted in Civility, Devotional Thoughts and tagged Civility, Created, Creator, Cursing, Praise, Wellspring. November 5: My anger is not a “spiritual gift” or any kind of gift from God. I won’t beat this one too long today. Let’s just accept the premise that James gives us that our anger is not productive, not in God’s kingdom. 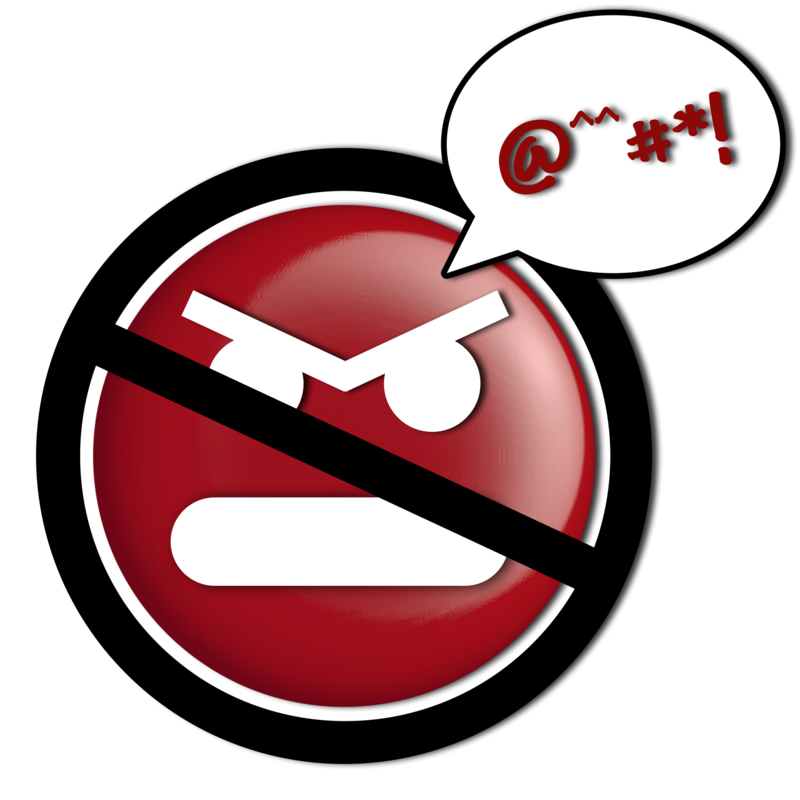 So much incivility flows from our anger. It comes from our hot, burning anger in the intensity of the moment, and from the slow burning rage that simmers and consumes. Neither bring about the right-ness that God desires. I’ve known Christians who seemed to think that their anger was a spiritual gift and a necessary tool of the kingdom, and they gave their anger full rein to run and romp. Crap, I’ve been that Christian. Who doesn’t like to burn with a little righteous indignation? Sometimes it is a legit response to evil. Sometimes it’s more of an addiction to the the adrenaline coursing through our veins. Sometimes it’s a sweet balm for our bruised ego. We too often embrace our anger. It feeds our ego. It fires our imagination. And though embracing the anger might do well for our favorite superheroes battling evil in their comic book and cartoon worlds, in our world, it kills and stunts us. Anger itself is not the problem, as we all feel it sometimes, but it’s letting the anger guide us that causes the trouble. Scriptural voices are really clear on this… Jesus says that our anger leaves us subject to judgment (Matthew 5:21-24), and Paul warns against letting anger lead us into sin and letting it grow over time (Ephesians 4:26). We have to put our anger aside. It’s not a tool, a gift or a strength. James connects it with too much talking and too little listening. So let’s shut our mouths, open our ears, and let go of the anger. If we seek God’s righteousness, anger is not the ride that will get us there. Civility and so much more suffers in the face of our anger. This entry was posted in Civility, Devotional Thoughts and tagged Anger, Civility, God's Righteousness, Spiritual Gifts. November 4: What is my way? Do I follow a way of cursing or a way of blessing? St. Paul seems to believe that there is a harmony that exists outside of conformity or agreement, revenge or vengeance. In the face of those who disagree with us, even violently, Paul’s calling us to harmony. If Jesus hadn’t already presented us with the blessing of the peacemaker and the idea of not having enemies, I might just not worry about Paul on this one. But as it is, he’s following the lead of Jesus. Harmony. 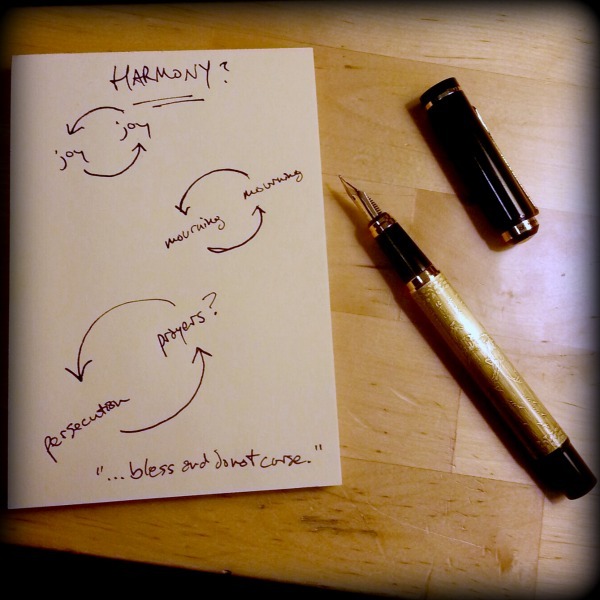 What is a harmonizing life and behavior? In Paul’s view it seems to include an intense awareness of the other person and a response to them that meets their best interest and needs. So if the other is happy, be happy with them. If the other is hurting, hurt with them. If the other is attacking you, look into their situation and see their hurt, their pain and their need, and lift that in prayer. I’ve heard several wiser people than I mention the principle that “Those who cause pain do so out of their own pain.” Seeing the offender’s hurt is a needful step in responding in a way that might lead to their healing, and my truest healing as well. Empathy seems to be a fundamental need of civility. We must learn to see the other and truly recognize where they are coming from and where they are going, otherwise we are just going to keep speaking out of step and missing each other. If we can’t emphasize with the other we’ll surely demonize them. Not only do we run the risk of falling into a cycle of vengeance, but we also miss the chance to share the other’s joy and share the other’s pain. This doesn’t mean we let ourselves be used and abused again and again. It means that we side-step the ego’s demand to retaliate and punish, which opens the door for a better response. Perhaps when we take a step to break that cycle of causing pain and pray for the one least deserving of our prayers, we might open a door to the needed healing. It seems that harmony is another step away from the idea of dominating, defeating or winning. It sounds more like participating, sharing and supporting. It also sounds costly, because it demands an investment from me: energy, empathy and forgiveness. Honestly, the one persecuting and mistreating may never change. Their behavior might continue to be destructive. Our prayers have a layered effect of helping us maintain our responsibility to be as civil as we can, of helping us lay down the burden and move on with our healing, and of making sure that our voices are not found among the sources of discord and disharmony in the world. Since we can only do what we can do, harmony is always our effort. Choosing a “way of blessing” for our lives is a daily walk, not necessarily a destination. I might often get a little off course, but hopefully not too often. That simple phrase in St. Paul’s verse “bless and not curse” is maybe the place we most engage harmony. It reminds me of the medical mantra, “first do no harm.” What’s my reflex? Do I move to curse or to bless? Am I a person of cursing or of blessing. What is my way? I guess I’m still working it out, but hoping to tip the scale toward blessing. This entry was posted in Civility, Devotional Thoughts and tagged Blessing, Civility, Empathy, Healing, Mourning, Rejoicing. November 3: Civility means I have no enemies, or at least don’t treat people as if they’re my enemies. A lot of incivility comes from our habit of dividing ourselves one from another. Our ego demands it of us. Often our ego demands we read scripture in such a way that we see ourselves separate from others, and therefore better, more correct, more deserving, more “right.” We just seem to enjoy our “us” having a “them.” We want a bad guy to revile, and then we learn to enjoy the reviling. Who doesn’t enjoy cursing an enemy? Who doesn’t hesitate to defame an enemy? Who doesn’t leap at an opportunity to discredit or even distort the words of those who distort, defame and accuse them? Answer: People trying to follow the teaching of Christ, it seems. 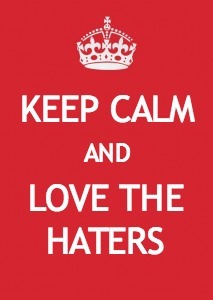 Jesus calls us to love the haters. Jesus calls us to pray for those who would hurt us. It seems like Jesus might not understand what an enemy is… or maybe Jesus simply doesn’t expect us to have enemies. Because that’s the ultimate extension of this teaching, that I do not view anyone as an enemy. Instead I treat all people with peace, dignity and respect… even love. Wow. This is cycle-breaking stuff here, if we live it. This teaching breaks the cycle of incivility as those who defame and attack us are not faced with a reciprocating hatred and attack. In our systems of winning and dominating, this sounds like acquiescence and defeat. When we focus on conflict and retaliation this feels like losing. When we focus on peace, on love and integrating others into our prayers, it becomes liberty and victory. There’s very little chance I will wake tomorrow in a world filled with people who all think like me and who all like me. But I can wake without enemies. I can face a world tomorrow that is filled with opportunities and relationships instead of arguments and verbal skirmishes at our points of dissimilarity. Let’s meditate on walking today and waking tomorrow with fewer enemies, because we have brought them to our hearts in prayer and made a place for even the most vile acting and speaking of those who are not like us, and who do not like us. Can we at least begin to have fewer enemies if not none? Are we ready to pray some truly difficult prayers, for the blessing of our enemies? This entry was posted in Civility, Devotional Thoughts and tagged Break The Cycle, Civility, jesus, Love The Haters, Love Your Enemy. November 2: Civility flows from valuing peace. What do I bless? Jesus does many surprising things in his teaching, and the passage we call the “beatitudes” is where he kicks off a major reordering of our lives. The idea of being a peace-maker is a lost art in most discourse today, even in religious discourse. Jesus called the peacemakers “blessed.” We sometimes call them derogatory things like weak, waffling, appeasing or losers. We too often prefer “winning” and at all costs. We’re usually too concerned with “winning” or “dominating” to worry about peace. In a society that is drenched in criticism and division we gravitate to what we perceive as “strength.” We too often bless the harsh. We bless the clever and the sarcastic. We bless the scathing turn of phrase. We bless the spin. We bless the winner. Today’s social media and inter-connectivity is cool, but it’s also fast and furious. I’m not sure why, but alongside our increasing ability to share, we’ve developed an increased ability and joy in criticizing and tearing down. So our sharing becomes a contest, a war of images and words to see who can score a point, defeat an opinion or win a debate. The troll lives in each of us. Jesus blesses a weird bunch of people in Matthew 5… poor, hopeless, mourning, hungry and meek to name a few. He blesses those who show mercy. He blesses those who strive for peace. As religious people and folks driven by faith, we sure spend a lot of time speaking of one another and acting toward one another in uncivil ways, peace-breaking ways. One of my favorite quotes from Mother Teresa of Calcutta, “If we have no peace, it is because we have forgotten that we belong to each other.” The gift of speech and language is an awesome responsibility. The beatitudes present us with a picture of a reciprocating community in which the grieving are comforted, the merciful find mercy, the heart-full seekers find God and those committed to peace are named the offspring of God. I like to think of this passage as a wheel with spokes… there’s an integrity and completeness to the design that moves it forward. Strike out a spoke and the wheel is weakened. Supplant peace with coercion, force or discord, and the wheel grinds to a halt. If we cease to bring comfort and mercy, who will bring it to us? I also like the language of inheritance in the passage. Inheritance is the created wealth and legacy of one generation imparted to the next. What inheritance are we leaving? Are we leaving an example and inheritance of peace by being a people devoted to one another? Are we leaving an inheritance of a faith in ruins from our cutting remarks and judgmental criticisms that bring more grief and less peace, even as they win arguments or bolster our own position? Let’s meditate on the peace in which Christ has called us. Let’s meditate on the griefs in which we have been comforted, by God and by our community of faith. Let’s prepare ourselves to strive for a peace that does not require someone’s defeat. What do I bless? 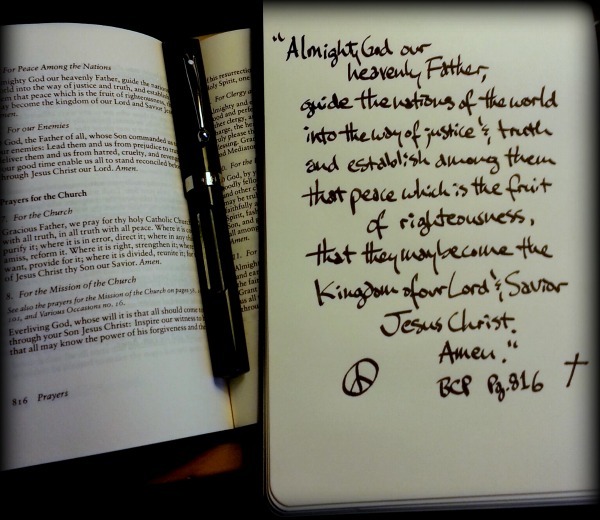 This entry was posted in Civility, Devotional Thoughts and tagged Blessed, Civility, jesus, peace.